Circles are an exciting and often confusing shape for middle school students to understand. This lesson is a prerequisite lesson to help students prepare for learning what pi is and how to find the circumference and area of a circle. .
Students will understand the defining elements of a circle and be able to find the radius and diameter of a circle. 1. Ask students to form a large standing circle. From this position, collect students’ input on “how” they formed the circle and what a circle is. As students share out, have a class scribe (one of the students in the circle) write down their ideas on sticky notes. To deepen the understanding of what a circle is, remove one of the students from the “circle” and have him /her stand in the middle instead. Continue the class discussion on what a circle is until you have had 5-8 students to contribute their ideas. A circle is a series of points all equal distance away from a defined point (the center). A circle is a continuous curve. The circle is technically the space confined within the points. 2. Review students’ sticky notes. 3. 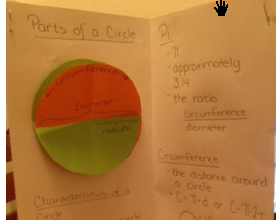 Create a foldable on the parts of a circle. This foldable can either be a foldable just for this unit, or it can cover the 7th grade geometry unit (parallelograms, triangles, circles, and 3-d figures). Included in the lesson plan is a sample for the circle section filled in by the end of this 3-session lesson plan. 4. Give each student two small square sheets of paper in two different colors. Have the students trace the same small circular item (bottom of mug, jar lid, etc.) on each sheet of paper. Cut out both circles. You should now have two congruent circles. Fold both circles horizontally and vertically. Cut a slit to the center on each. Overlap the two circles. Pass out a brad to each student to make a rotatable circle. 5. 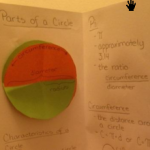 Complete the first half of the Circle Foldable (showing parts of a circle, characteristics of a circle, and some sample radius and diameter problems). 6. Homework/Review for this session can be a worksheet on radius and diameter.